In my life, I have loved 3 men. The first my highschool sweetheart, Stephen, the second being Erik, and the last being my husband Geoffrey. Each one of these men made such a difference in my life. Focusing on the last 2, I am so grateful for my husband to the wonderful father he is and for being the man I needed in my life. I am also so thankful to Erik, for giving me this wonderful and beautiful child. All the love I felt for him was took root in the child. I wanted to say this because, on Friday, my handsome boy turned 6 years old. I can't believe how fast time seems to go. It seems like just a few months ago, he was wearing diapers..... For his birthday we had a family party and he got plently of unnecessary candy, Wii games, clothes, and movies. All of those are his favorite except the clothes, however, I highly appreciate them. We asked Wyatt if this year we could skip the kid party. We put so much money in having the kids party that it is ridiculous. 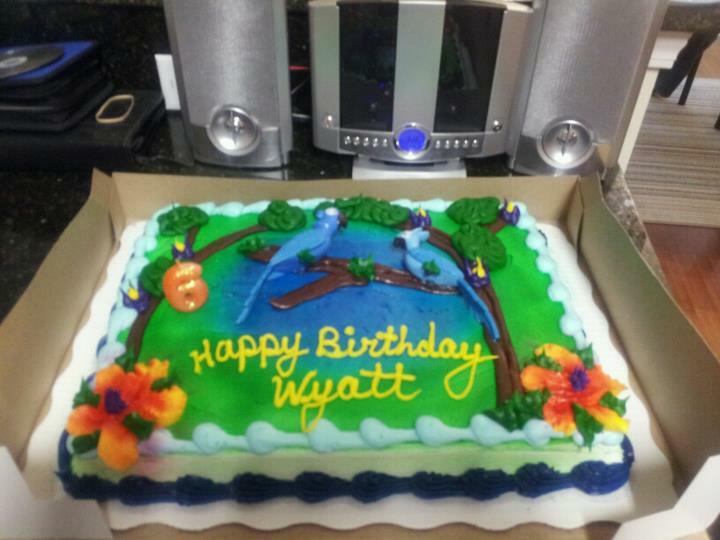 We told Wyatt that he could pick whatever outing he wanted for his birthday and we would take him to do that. Stacy (his godmother) took him to see the Spy Kids 4 movie at the theater because he has been begging to see it and then Saturday night we took him bowling. He had a great time and was trying to give everyone bowling tips because he thinks he is so awesome! It was really cute watching him roll the ball and then squatting down with his hands on his face until it made it to the pins. So thank you to everyone who remembered his birthday and celebrated with us. I remember finding out I was pregnant with him, and how scared I was. I felt completely alone. I don't think either one of those feelings went away for a very long time. But God took all of that and made me stronger. I could look at my baby boy and know that I was going to do right by him. I was going to be strong for him. God gave me, my little boy, who has gone through so much, and will continue to struggle in life with medical issues, and he made him strong as well. Sometimes I look at Wyatt and think there is nothing he won't be able to do. I see him and know that he is special and is going to do something great. God gave me this boy and he is my miracle. Happy 6th birthday Richard Wyatt.